Spiriteds, summer just got a little spicier, like deliciously so. Because Homemade Pico de Gallo is in the howwwwwwse! And I cannot even. Also, I do not understand how to spell the drawn out version of “house.” We all have our problems. But, today’s pico isn’t one of them. Unlike last summer’s Hot ‘n Spicy Pico de Gallo made with bell peppers, today’s Homemade Pico de Gallo is a spicy blend of Roma tomatoes, cumin, white onion, cilantro, and jalapeños. So freaking amazing. So extra for the summer. Just the way my dad taught me. When I was a child, Dad introduced me to this spicy topping/appetizer/sauce/dream come true. And in college, I tried to reinvent the recipe in my apartment. I’m not sure I got quite as close as memory served. I do remember it being A LOT more work than I thought it should be. 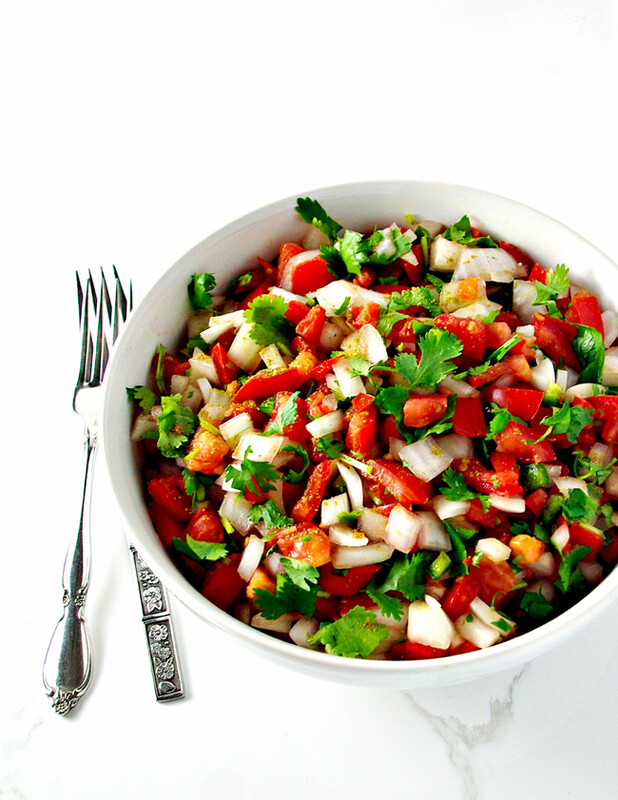 But today’s Homemade Pico De Gallo is much easier to prepare and absolutely fits the bill. It’s how I remember Pico de Gallo tasting some thirty years ago. And did I watch Dr. Quinn, Medicine Woman as I prepped and photographed it? Well, of course I did. Instead of a tornado, this time Reverend Timothy lost his eyesight at Christmas. Again, I could not even. Why do I sit through this stuff when I only just cry/watch each episode? Dear God, WHY DO I DO THIS EVERY TIME? Because I can’t help it, and also I think the next episode will be easier on the heartstrings. So I only half watched because my heart and tears were absolutely drained. But I digress. We were here talking about Homemade Pico de Gallo, which happens to be a vegan and paleo recipe. But what can you do with it? Exactly how much time do you have? First, this Mexican dish pairs excellently with tortilla chips. 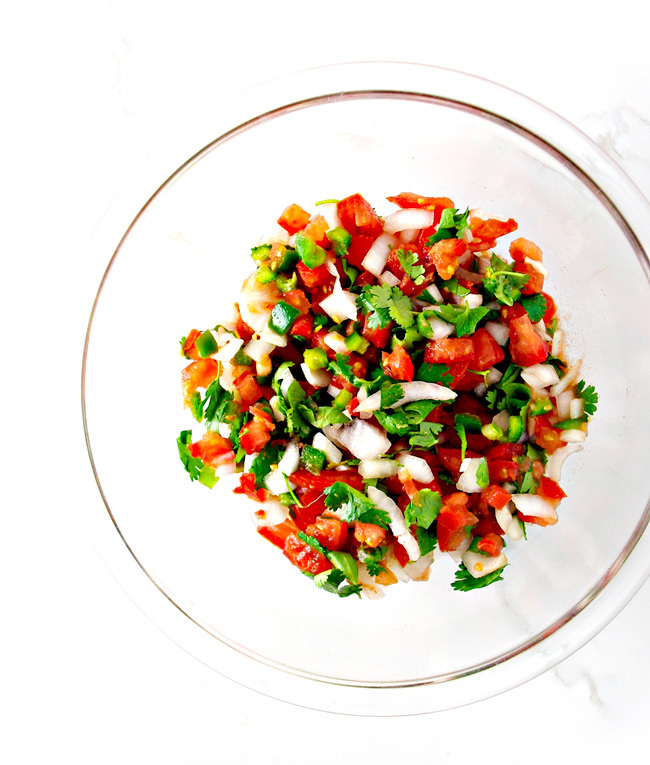 I researched whether Homemade Pico de Gallo is actually a salsa. In last year’s Hot ‘n Spicy Pico de Gallo post, I said it was not salsa because pico ingredients are not cooked and the final product is not a liquid sauce. But a little internet research indicated I am so wrong. 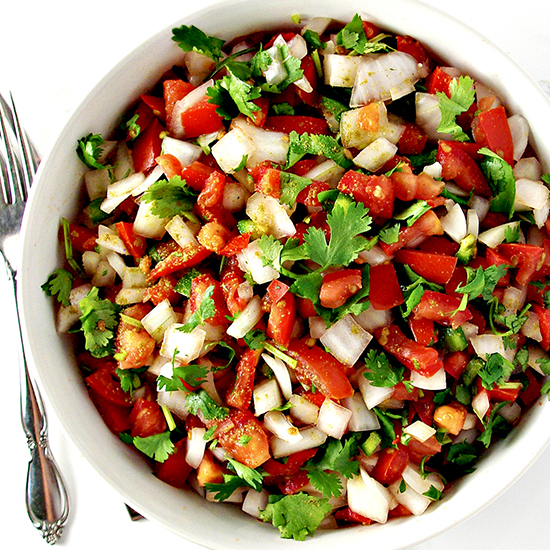 Pico is considered a type of salsa, in this case, salsa fresca. Ooh, and it also means “rooster’s beak,” possibly because of the similarly shaped Serrano chiles used in the recipe or because people used to eat the dish by pinching pico between their index finger and thumb. So there you have it. Straight from Wikipedia. Only the best for this blog. 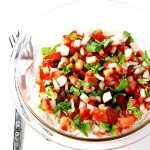 But whether you consider it a salsa or not, today’s Homemade Pico de Gallo recipe can be enjoyed like one. Chips and pico for the win! Next, think about seafood. 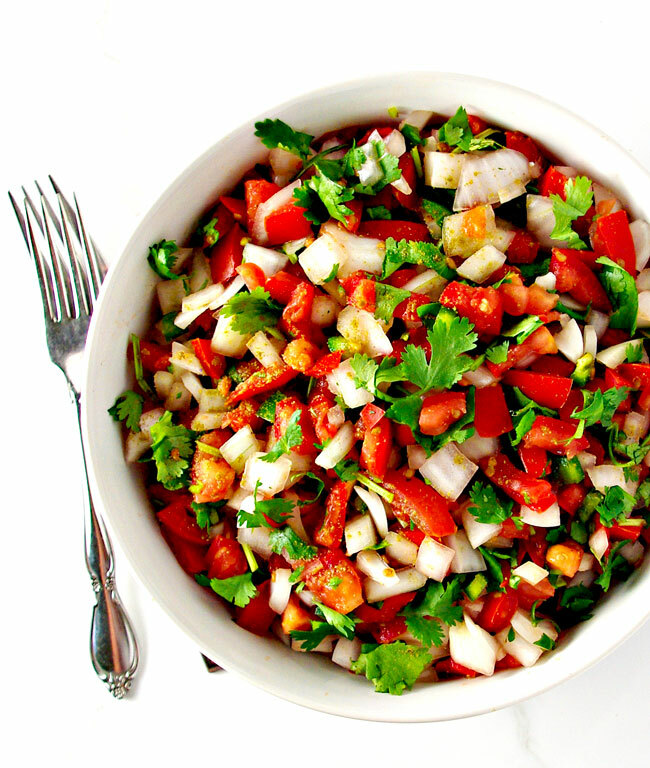 Dip some shrimp into your pico and bite away. So absolutely delicious. It also goes serves well as a sauce or spread for burritos, tacos, fajitas, enchiladas, and burgers. Basically, if you can bake it, fry it, sauté it, spear it, grill it, love it, then you can pico it, too. And lastly, I love to add it to salads. Nothing fancy, just a basic green lettuce salad and all the Homemade Pico de Gallo I can reasonably fit on the dish. 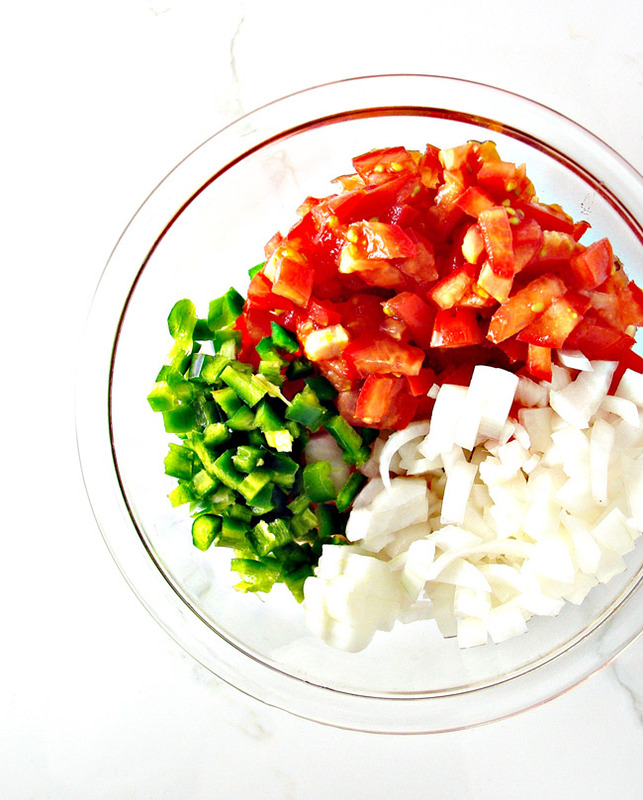 If you are new to Pico de Gallo, rest assured it isn’t difficult to put together. At least not nearly as difficult as when I made it in college. This time I diced Roma tomatoes, white onion, and jalapeño peppers. Then I added minced cilantro, ground cumin, lime juice, and sea salt. Here’s the deal on those last ingredients. It is a crapshoot exactly how much to use. I typically add 1/4 teaspoon cumin, 1 tablespoon lime juice, and 1/8 teaspoon sea salt. Then if I feel like it lacks the spice I want, I’ll add the same amount of each again. And sometimes it’s a taste-test recipe ~ a little spritz of each until I have the balance I want. Same with the jalapeños. Start with one. See if you like it. Then consider adding the other. Sometimes the jalapeños are super spicy and other times they are surprisingly mild. Add a little at a time and go with what you like. And for best results, use fresh cilantro and jalapeños (translate this as: buy and use within 24 hours). Ooh, and if you need me, I’ll be over here just cry-watching Dr. Quinn, Medicine Woman, LIKE I DO. 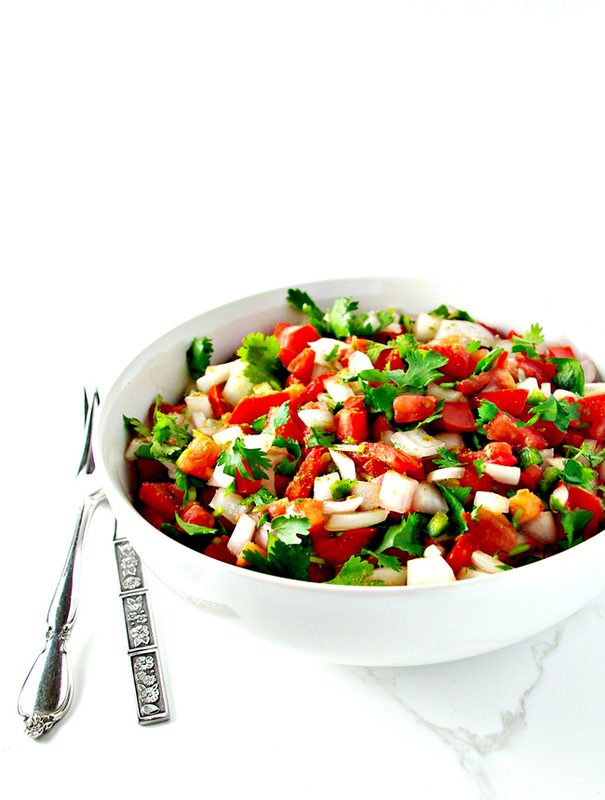 In a large mixing bowl, combine tomatoes, onion, jalapeños, lime juice, cumin, and sea salt. Stir evenly, and then add in cilantro. To manage the spiciness level, for each jalapeño I add 1 tablespoon lime juice, 1/4 teaspoon cumin, and 1/8 teaspoon sea salt. From there I add a little more of each if I feel it’s necessary, often doubling the amount of lime juice, cumin, and sea salt. This is personal preference and will also be determined by the freshness of the vegetables and spiciness of the jalapeños.